Make the Special Sauce: Whisk all ingredients together, until combined. Set aside. Make the burgers: Combine beef, breadcrumbs, salt, pepper and garlic powder in a large bowl. Drop spoonful's of the meat mixture on a large rimmed baking sheet, pressing gently to form an even layer. Bake 13-15 minutes, until the top of the meat is no longer pink. Drain excess grease, top beef with cheese slices, and bake until cheese has melted, about 1 minute. Make the buns: Without pulling apart the buns, slice rolls into three sheets. Brush the top buns with melted butter and sprinkle with sesame seeds. Brush the top of the remaining layers with butter. Place all buns on a baking sheet and broil 30 seconds, or until lightly toasted. Spread special sauce along the bottom buns. Top with shredded lettuce and onion. Add one layer of burger patties. Top with the middle section of buns. 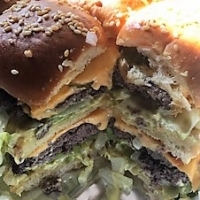 Repeat layers, adding pickles before topping with sesame seed buns. Score with a chef’s knife, separating them completely. Serve.